It’s summer, I’m down in Belize for a few weeks and for once there are avocados everywhere! 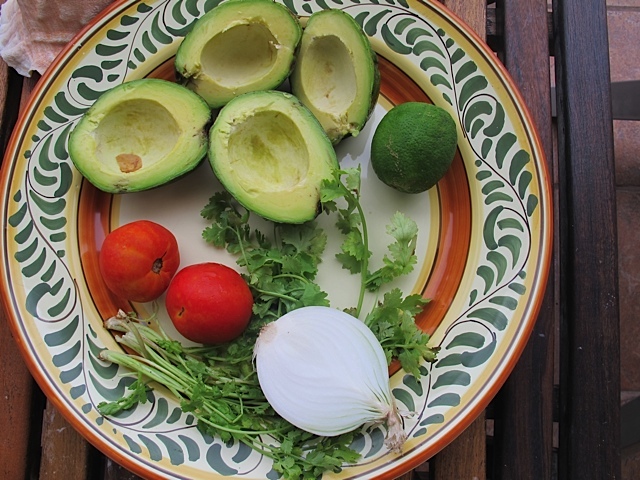 These avocados are most likely from neighboring Mexico – not hothouse ripened, mind you. When they are soft to the touch, you can shake them and hear the seed bounce back and forth. In general, these avocados are a little larger than those I buy in Seattle at the supermarket (where they are definitely not a local food item!). Guacamole is one of those things I never make in Seattle. When there, I buy avocados and cut them into salads or I often just slice them in half, remove the seed and drizzle them with extra good, extra virgin olive oil and sprinkle with salt, then I spoon the flesh into my mouth. 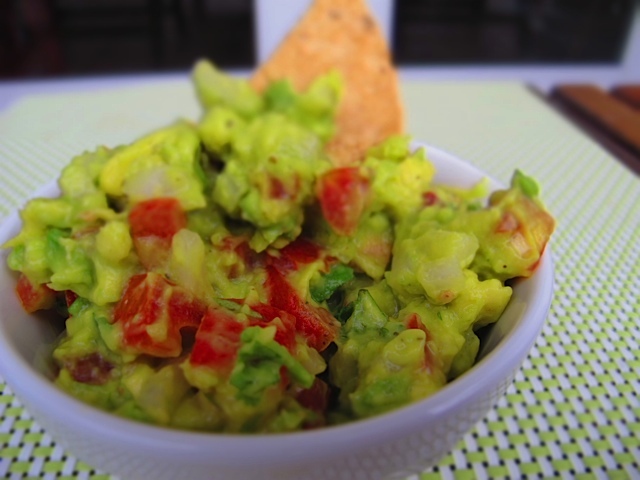 BUT, in Belize they taste great mashed into “guac” and served as an appetizer with fresh masa (corn) chips. So what is so hard about making guacamole? Not a thing, other than gathering the ingredients. A couple tricks I know that makes my guacamole noteworthy: 1) I never overmix the veggies – I like chunky guacamole with some texture, so I only mash the avocado with a potato masher until it is broken up a bit. 2) I always always always rinse the diced onion with water. This removes some of the bitter oil and keeps the onion from overpowering the dip. Incidentally, I do the same thing with raw garlic, not just in this recipe but whenever raw onion or garlic is used because otherwise the taste overpowers me for way too long. 3). I don’t skin or seed the tomatoes. I keep it simple and rustic and easy to boot. AND, finally, this is my original recipe. I did not search on the internet – I simply created a dip to my liking based on ubiquitous ingredients. Mash avocado with a potato masher. Add rinsed and diced onion, diced tomato, chopped cilantro and lime juice. Barely combine with a spoon. Add black pepper, sea salt and hot sauce, stir and taste. Add more lime, cilantro or salt to your taste. Serve with fresh corn chips. This entry was posted in Appetizer, Central America and tagged Guacamole. Bookmark the permalink.